Tottenham fans were left relieved as they saw their side saved from another crushing defeat by two late goals. 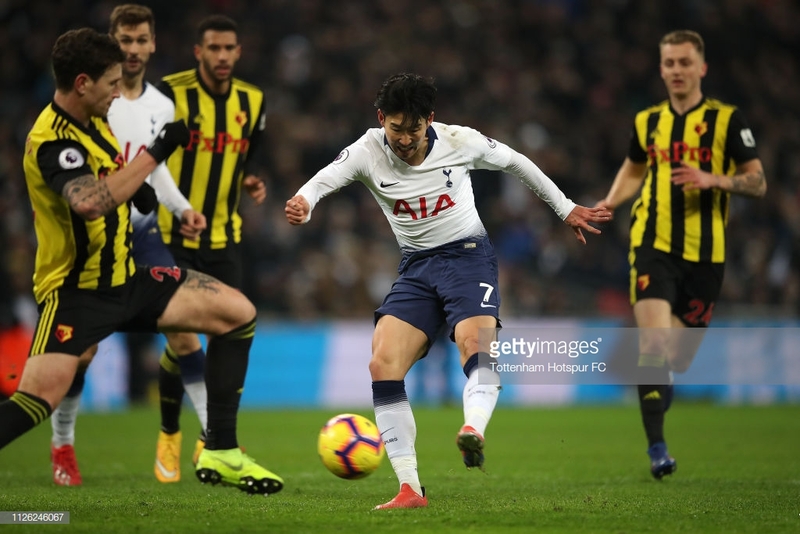 Heung-min Son marked his return to Tottenham Hotspur with a Man of the Match performance to help salvage a late victory over Watford. Spurs once again went behind in the first-half again but this time were able to claw back the three points with two late goals. The victory came on a night when Chelsea suffered a humbling 4-0 defeat to A.F.C. Bournemouth to see Spurs move seven points clear of the Blues and Arsenal. From the first couple of minutes, Heung-min Son looked sharp and fresh as the South Korean clearly wanted to get a hold of the ball and open the scoring. Without the presence of Harry Kane and even Dele Alli, Spurs lack that threat, a danger man but Son certainly knew he was there to act as Tottenham's main man. It was a mature performance from the Korean who has just recently returned from the Asia Cup in Abu Dhabi. It was reported he was suffering from fatigue since returning but he did not show it on Wednesday night. The 26-year-old saw a couple of efforts whistle just wide but with 10-minutes remaining, he kept his cool inside the box and cannoned a left-footed shot past a helpless Ben Foster. Spurs fans will definitely be pleased to see Son back as he has already shown the fans what they were missing whilst he was away on international duty. It was another fairly horrendous performance from Fernando Llorente on the whole as the Spaniard looked like he was set to rue a number of missed golden opportunities. In the second-half, Llorente squandered a superb chance to put Spurs level after his initial shot was saved by Foster the 33-year-old then saw his follow-up effort sail over the bar from a matter of yards out. With it appearing to be another disastrous shift from Llorente, Danny Rose's delicious cross was met by the 6ft 4" striker and headed beyond a stranded Foster and into the far corner. The relief was evident, Wembley roared into life - albeit the low attendance and Llorente began his celebrations running to Mauricio Pochettino. Perhaps its a case of not playing enough game time over the season but Llorente has looked rusty in his few appearances since Harry Kane's injury has seen the Spaniard brought into the starting XI. Pochettino will hope he has finally shaken off the cobwebs after Wednesday's winner. For the fifth game in a row, Spurs have found themselves behind at half-time. This was only the second of the five games in which the Lilywhites have been able to claw back the points after their slow starts. Their case was not helped by a costly error from their captain, Hugo Lloris. The World Cup-winning captain came charging off his line from a Watford corner but failed to win the ball leaving Craig Cathcart an open goal to aim at and a Spurs keeper stranded six-yards off his line. It seems a lot has gone against Spurs in the past few weeks with injury problems and a lack of transfer dealings, however, it is not helped when established players such as Lloris makes an error as big as he did costing Spurs a goal. Spurs face Newcastle United on the weekend, the Magpies also came back from a shocking start on Tuesday to shock the league in beating current champions Manchester City. Both sides will be hoping for a better start than they had in their midweek games.